This course is set over 2 days. On session 1, an evening meeting, participants will learn the theory and practical aspects of landscape photography. It is an opportunity to understand the techniques and strategies used by a leading expert in this field. Day 2 will be a field trip putting the theory into practice. Details of time and venue, of field trip, will be advised by your tutor during the first session. The course is structured for those wishing to start out in or to further develop their landscape photography skills. Some familiarity with your camera is assumed. Your tutor for this 2 day course will be published landscape photographer John Hodgson. Note that the field trip day will be at least 3 hours but may go for up to 6 hours. Click here for online bookings and payments. 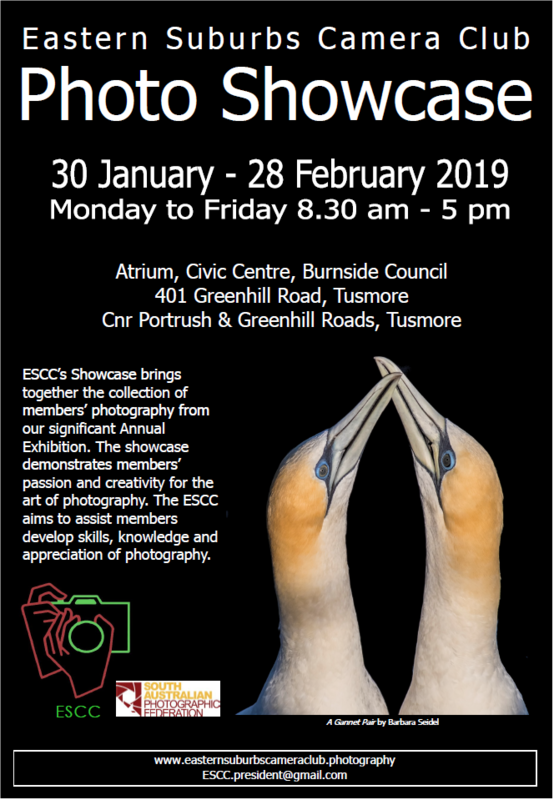 Come along and enjoy the exhibits of our local Camera Club Community. The South Australian Photographic Federation 2019 Annual Exhibition will be opened by Dylan Toh of Everlook Photography. Dylan is a highly respected local landscape photographer who has spoken at several of our clubs in recent years and will no doubt inspire those who attend the opening night. Make showing your Images Entertaining. Discover a different and creative way to enjoy your photography. This day course will teach you how to plan and construct an Audio/Visual presentation. Click here to open a full description and further information. This 2 day course focuses on helping all participants understand some of the power of Photoshop to enhance and manipulate their images. Designed for those with little or no experience, it will also be valuable for those who have begun to discover some of the benefits of this powerful and adaptable program. Note that all participants will need to bring their own laptop(or desktop) with a recent version of Photoshop or Photoshop Classic CC installed. If you do not have either of these then please note that a free 7 day trial version can be downloaded from the Adobe site prior to the course. This workshop, presented by the APS and SAPF, focuses on helping all participants enhance their skills in capturing wildlife and nature images. It is a rare opportunity to develop your understanding of the techniques and strategies used to capture quality nature images and is taught by two leading experts in this field. The one-day workshop will be followed by a 2 hour review session the following Tuesday week. Day one begins discussing use of equipment and techniques, here you will learn how to use your equipment to capture animals, plants and insects in their natural environment. Most of the day will be spent in the field. The course is structured for those wishing to start out in or to further develop their nature photography skills. Some familiarity with your camera is assumed. Theory and Practise - Sunday 16th September, 9.00am to 5.15pm. Review and Feedback - Tuesday 25th September 2018, 7.00 to 9.00pm. $80.00 for members of an SAPF affiliated club - Note that you will need to enter the members code at checkout to obtain the $40 discount. Your club secretary can advise you of this. Put the ‘WOW’ factor into your images. This 2 day course is designed for those with little or no experience with Lightroom. We will show and explain the Lightroom layout and coach on how to import your photographs as well as teach the filing options available to you. You will discover the editing and enhancement of your photographs and how to export/share your images with your friends and associates. Your tutor will be Ron Heptinstall. Discover how to take great photographs with your digital camera. Course tutor, Brian Plush, will use non-technical language to explain what each of the buttons on your camera does and how they are used. Learn to take your digital camera off its auto setting by being more familiar with its basic features. Click here for a detailed course outline. The 2019 Adelaide AV International, a biennial event which is now the largest of its kind in the world, will take place at the West Torrens Auditorium, Hamra Centre, 1 Brooker Terrace, Cowandilla, from 27 - 31 March. A record entry of 149 sequences from 16 countries has been received. An AV Workshop will be held, at which Bruce and Alia will talk about their AV interests and techniques. Tea and coffee will be provided and there is no admission charge. Judging will take place from with breaks for morning and afternoon tea and lunch. There is no entry fee, but there will be a gold coin donation for tea and coffee. A gala presentation of the award-winning sequences, with afternoon tea to follow. Admission is $5.00, which includes afternoon tea. Audio Visual is a medium which draws on a variety of different skills, including photography, script writing, and audio recording. Come along and see an amazing variety of work by some of the world’s best AV Makers. The Noarlunga and Southern District Camera Club Inc will be hosting a visit by Stavros Pippos on Monday 11th March at their Club room at the Port Noarlunga Arts Centre, 22 Gawler Street, Port Noarlunga, entry around the back in Ward Street, opposite Becks Bakehouse. Doors open at 7.00 pm for 7.30 pm start. He will be talking about his photographic exploits, which sometimes can be a bit hair-raising! He will have some of his coffee-table-type photographic books for sale at $40.00 each, but cash only as he doesn't have credit card facilities. We are inviting anyone who is interested in photography, particularly landscape photography, to come and join us. We request a gold coin donation from all visitors to assist with the costs involved. It will be a very interesting evening, and there will be the opportunity to buy a very good book showing photographs from around South Australia, but remember -- cash only! Image: Self Portrait, Flinders Ranges, Courtesy Stavros Pippos. Course tutor Brian Plush, will use non-technical language to explain what each of the buttons on your camera does and how they are used. SAPF Annual Exhibition 2019 - Entries Open! It's on again! Time to find your most impressive images and pit them against the best that other club members have to offer! Members of all SAPF affiliated clubs, and Associate Members, are invited to participate in the competition of the South Australian Photographic Federation 2019 Annual Exhibition. If you don't feel ready yet you have until March 10th 2019 to get your entries in and with 14 categories spread across print and projected digital images you can be as creative or traditional as you like! Note that WHITE MATS will be accepted on prints this year as well as the usual black! See Entry Information SAPF Annual Exhibition 2019 and Uploading Instructions SAPF Annual Exhibition 2019 for all of the important details and then click here to enter. Accepted images will be displayed in the West Torrens Hamra Centre Gallery followed by The Myer Centre so this is a great opportunity to showcase your talent! The Adelaide Camera Club Exhibition Opening and Awards Night will be held on the 11th December, commencing 7pm, at the West Torrens Library Exhibition Centre (Hamra Centre) at 1 Booker Tce, Hilton. The exhibition will show over 500 digital and print images, and trophies will be awarded in 11 categories. Lou Marafioti will provide an opening address. A warm invitation is extended to all SAPF members. The exhibition is open to the public and will run to 29th December. Your tutor for this course will be John Hodgson. Details of time and venue will be negotiated with participants at the first session. Note that the day will be at least 3 hours but may go for up to 6 hours. Learn to add the ‘POP’ into your landscape images. Closing date: Friday 16 November 2018. This exhibition is open to all, so if you have made an AV from your photos or a travelogue why not put in an entry. In any event, please put this date in your diary for a night of entertainment. You will have an opportunity to view Audio Visuals, see the judging process and even cast your own audience vote – all on one night. Supper is included in the entrance fee of $5.00. An open invitation to all SAPF affiliated members to enter or attend this exhibition. This is the second day of our two day Photoshop Basics Course. Please see Day 1 for details. Here are some of the photos produced by SAPF/APS Nature & Wildlife Course Participants! Both the theory and hands on components of the course were both informative and fun - the field trip participants had the opportunity to experiment whilst having experienced tutors on hand… a great time had by all! If you interested in participating in this course or another, please contact our course coordinator Sam Savage on coursecoordinator@sapf.org.au or click here to see all SAPF run Courses. Royal Adelaide Show 2018 - SAPF Winners! Congratulations to all SAPF Members who won awards at the recent 2018 Royal Adelaide Show including Annette Cakebread, Brenda Jones, David Rowlands, Emma Fleetwood and Ian Patterson. SAPF would like to congratulate Peter Barrien on being a finalist in the Australian Geographic Nature Competition.for ‘Nature Photographer of the Year 2018’. Why not go along and see Peter’s and other finalists work on display? See Day 1 for full information and booking. On session 1, an evening meeting, participants will learn the theory and practical aspects of landscape photography. It is an opportunity to understand the techniques and strategies used by a leading expert in this field. Through the Lens - Peoples Choice - Vote Now! Just by voting, members of the public who choose their favourite photo have a chance to win a DJI Spark Quadcopter Drone valued at $692! ‘The photographs of Diane Arbus (1923–71) are among the most widely recognised in the history of photography. Her images stand as powerful symbols of post-war America and, once seen, are rarely forgotten.’ A rare opportunity to see the work of an icon of photography. Tracey Moffatt is an important contemporary Australian photographer. Your tutor for this course will be John Murray.